The principle home of the Philadelphia Stars in 1983 and 1984, Veterans Stadium was built over the course of three years, finally opening its doors in April 1971. 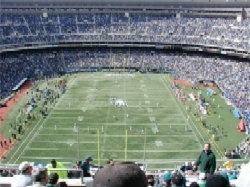 The home of baseball's Phillies and the NFL's Eagles, the facility proved to be insufficient for either team thanks to its "cookie cutter" configuration, which among other things featured seven different levels of seating. The Vet quickly developed a notorious reputation. The AstroTurf playing surface was so poorly laid that gaps and uneven patches could be found, regularly resulting in the stadium getting the unofficial ranking of the "NFL's worst field" in player surveys. Players careers literally ended as a result of the field's conditions, and on one occasion in 2001 a pre-season game between the Eagles and Baltimore Ravens was cancelled due to the playing surface. Also, the fans at the Vet quickly developed a reputation for being the most obnoxious in all professional sports, regularly hurling insults - and when available, snowballs - at opposing players, members of their own team, or anyone else who crossed them. The city eventually put a miniature jail and had a municipal court judge on hand to deal with those removed from the stands for rowdy behavior. None of this had an effect on the Stars, however, who won regularly at the Vet. After fans were slow to turn out in 1983, a championship appearance helped propel attendance upward the following year. Unfortunately, Philly fans would not get to celebrate the 1984 title for long because USFL owners voted to move to a fall schedule, and the Stars would relocate to Baltimore for 1985. The Phillies and Eagles would later move on to new facilities, and on March 21, 2004 the Vet was demolished via implosion.